Same song, second verse pretty much sums up how I feel about The Sea of Monsters. I know the book is for a younger reader, but it was still awfully cookie cutter. I understand why my niece and nephew didn't get into the series. I don't think I will be listening to the rest of the series either. Though it might make a fun movie to watch (I think it is suppose to come out next year). For the intended audience, it is a good way to introduce the stories of Greek Mythology. And I did kind of like hearing about the various myths (if you read my Flash Five Friday post, you know I missed this unit during my educational training) without having to read the full stories. I think my biggest problem with the second book is that I don't feel connected to the characters. I don't care about who anyone is and often forget who is allied with whom. I've read a fair share of cookie cutter books, but it is always because of the characters that I can look past it. Once I stop caring about the characters, I've stopped reading the books. If you are an elementary student (or a parent looking for books for their elementary age child) that likes adventure and fantasy, then you should at least give Percy Jackson and the Olympians series a chance. 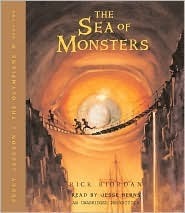 Book Review: "The Sea of Monsters"